Party Food: Bonnie's Margarita Wings. I have a fabulous friend, named Bonnie. 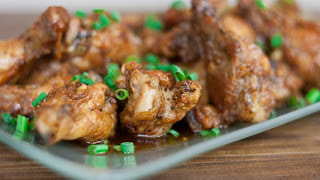 A few years ago she shared her recipe for delicious wings and I was floored by how simple it really was. I leave out the cilantro because hubby doesn't like it. And boozers can use 1 tablespoon each of triple sec and tequila instead of rice wine vinegar. Either way you'll need to make a triple batch because they will disappear. Line your broiler pan with parchment and bake the wings for about 20-30 minutes. Flip halfway through and cook to an internal temp of 170 F.
Melt the butter and whisk into remaining marinade ingredients. Toss the wings in the delicious mixture, garnish and serve.